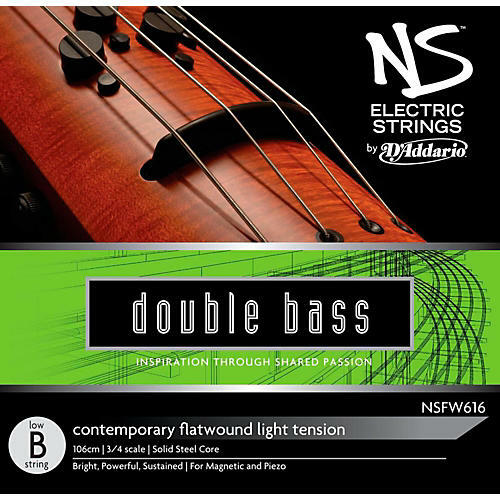 Designed in partnership with Ned Steinberger and NS Design, the D'Addario NS Electric Contemporary Bass Low B String can be used on electric instruments to bring out the best in them. This string is designed to enhance the expressive range of tone sought after by the most discerning players. This Low B string features a steel core with a stainless steel winding. The Contemporary Double Bass Low B String produces a brighter sound and is lower tension than the Traditional double bass low B string. The NS Electric Contemporary Double Bass Low B String is designed for electric upright basses with standard playing lengths, but shorter overall lengths (no tailpiece).